Happy Saturday!!! This week's Inspiration Challenge is to find inspiration from the Tea Bag Art board on Pinterest. 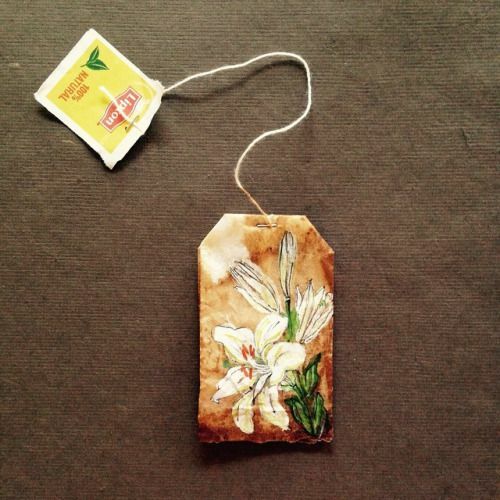 I thought that this tea bag with the white lilies was so cool and I loved the cocoa colored background. I dug into my stash of Close to Cocoa cardstock (which has been retired for quite a few years) for my card base. The small sentiments from 'To My Favorite', from Our Daily Bread designs, were stamped directly to the card base. The 'Stargazer Lily' image from the 'Beauty' set (also from ODBD) was stamped with Versamark on the card and then stamped onto the white tag with Stazon Jet Black, highlighted with markers, then coated with a clear glaze pen (to act as a resist). Cocoa, rust, and light tan inks were sponged around the image and on the edges of the tag, then water was spritzed over it to mottle the inks a bit. Since I didn't have any fancy colored staples, I used Stazon Timber Brown ink to stain a regular staple stack before placing them back inside the stapler. I did not have white string to mimic the tea bag string, so I used linen thread instead. I will also be submitting this card to the Friday FreeAll Floral Challenge, Fan Club 'Secret Garden' Central Theme, and the ODBD Shining the Light Challenge, which is 'Anything Goes with ODBD Stamps'. Thanks so much for looking! Have a very blessed day! Beautifully done....your ink work is amazing! Wow, isn't that tea bag art amazing. You've really made a perfect card from that inspiration! What lovely art you have created here! Your sister-in-law will treasure it forever. Beautiful white lilies. I like how you stamped the image on the base layer, too. The lilies are beautiful. I love the look of the sponging, really highlights the lilies. Angella this is gorgeous -- wow your painting and coloring is perfect!! Your SIL will love this! You took your inspired and created a lovely masterpiece...super. Love the background stamping and the tag is a great element. Congratulations! In the General Stamping forum, you're in the FAVORITES for the week ending March 19. See post # 5.